summer daily skin survival | BENY&CO. There's still rain everywhere, but as you know here is already summer sunshine in my country. Its not full a week with sunny day indeed, but trust me, if you're being me here. The sun was over confidence or what may be. Such an extreme wheater, rain in the morning and super sun light in the noon. I don't mind with my default sun block or regular body lotion product that i've already bought. But If there's an option, i'd rather to choose The very brand new Nivea UV Extra Whitening Advanced Moisture Care Serum. Ask Why? Because body lotion isn't enough for the extreme weather anymore! (Sounds too much?) 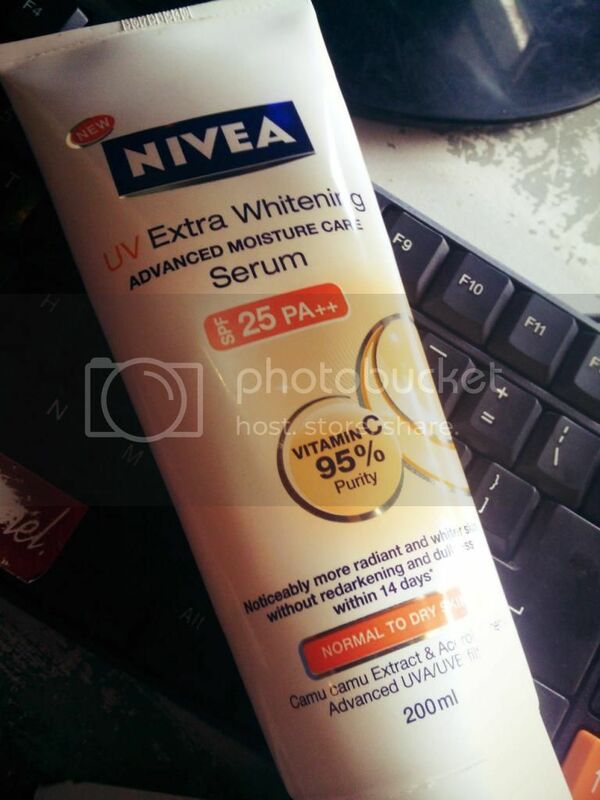 I think not, after i've got free skin tanning service (burn by the tropical sun) by the weather, and SPF 15 could translucent by the sun— Nivea UV Extra Whitening Advanced Moisture Care Serum come with SPF 25 PA +++ even better for my skin yah. Also complete with 90% vitamin C purity from Camu camu Extract & Acerola Cherry. This Body Serum may your last surviving weapon if you're not brought your jacket or outwear, and even have no time to apply sunblock. Implies easily absorbed and non-greasy on the skin. I've try my self in this couple weeks and i love the relaxing fragrances, it's stimulate an anti-stress to my skin. So i put this body serum everywhere, not excepted on my desktop. What about you girls, guys and gays? Whats your summer daily skin survival? Any another recommend? I wanna hear from ya!